Chinese State Councilor and Minister of Public Security Guo Shengkun (4th L) holds talks with Nepali Deputy Prime Minister and Minister of Home Bam Dev Gautam (5th) in Beijing, capital of China, Oct. 16, 2014. 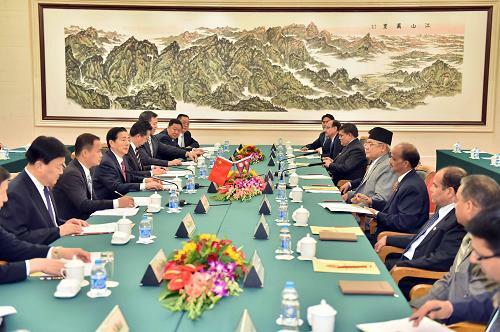 (TibetanReview.net, Oct18, 2014) – Preventing Tibetans from fleeing their occupied homeland continues to be a major area of concern and security cooperation between China and Nepal, with the matter being again highlighted during a meeting between leaders of the two countries in Beijing on Oct 16. During the meeting between Chinese State Councilor and Minister of Public Security Guo Shengkun and Nepal’s Deputy Prime Minister and Home Minister Bam Dev Gautam the two sides pledged to boost security cooperation between the two countries, reported China’s official Xinhua news agency Oct 17. The report cited Guo as expressing hope that the two sides will increase personnel interactions, improve mechanisms of cooperation, and boost practical cooperation on Tibet-related affairs, fight against illegal border crossing and drug trafficking to safeguard security and stability of the two countries. The number of Tibetans making it to exile has dropped sharply from 2,000-3,000 per year during the peak period in the 1980s and 90s to just about 500 now after China and Nepal strengthened their border security measures in cooperation with each other. China has paid for much of the border security and border police equipment on the Nepali side. The report cited Gautam as saying the Nepali government attached great importance to the friendship and cooperation with China and stood ready to continue deepening law-enforcement cooperation with the Chinese side.